In Qld they don't actually have a Grandview 37 available they only do up to a 36. So we changed the 36 to the Nsw 37. Really all the difference between the two is the removal of a wir in bedroom two, then a change of position of the toilet and the adding of a basin making it into a powder room. We prefer this as it opened up the pantry where previously it was blocked by the toilet so now we can dump groceries straight from the garage without walking around to get to kitchen. It also now means we get a basin and cabinets in our second toilet, suited our needs much better than the wir. All up with the changes it now becomes 39sq. Here is the standard 37 Nsw plan flipped. 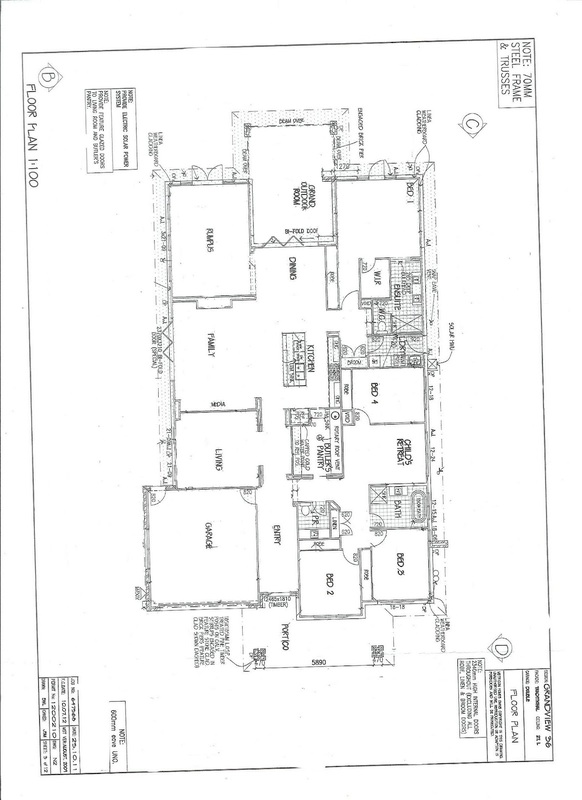 And here is our floor plan with some tiny changes. The following changes were made to the Nsw 37 plan. * Garage widened a tiny bit as I think when you pick the resort frontage it makes the garage a little smaller. * Family room made bigger and sitting room made smaller and added some bulkheads. * We made the porch deeper. * Added on a grand outdoor room. * By also picking the resort frontage it actually makes the whole house a tiny bit wider. * We have added in a bit to the family room to add a gas fireplace (technical terms here). We change a few of the doors and windows from the original plan as well. * Added bi folds to the family room instead of just windows. * Took out the sliding doors to outdoor room in rumpus and instead added three windows to the northern side and french doors with side windows overlooking the backyard area. * Took out the sliding doors in the bedroom to the outdoor area and added a single french door with side windows to the backyard instead. * Upgraded the height of the windows in sitting room to match the rumpus room windows. * Added internal cavity sliding glass doors to sitting room. * Added an internal cavity sliding glass door to pantry. * Made the bathroom window smaller. * Added a window to garage. * Added an internal door from the garage (can't believe this is not standard). * Made the front door taller. * As mentioned we also took out some corner windows from the resort frontage so we just have two simple square windows. I think the windows and doors were the biggest change. We changed a lot of these to take advantage of the northern sun and so that the rumpus and our bedroom opened up out to the backyard. We plan to have extra outdoor areas at the back outside the main bedroom and rumpus room and to also deck or concrete the area off the bi folds in the family room. I should say that the front of the house faces west, all of the living room areas face North (yay), the backyard in east and the laundry side faces south. Sorry, know that might be confusing but might be helpful for someone building this plan. Thankyou! Really looking forward to cooking for once, no excuses for me now.